The following families have genealogy eBooks on this page: Bontecou, Cohan, Daniell, Fitch, Guild, Handerson, Johnstone, Keyes, Rulison, Searle, Steiner, Talbot, Tyler, Tyson, Webber, Wickware, Williams, Wyman. 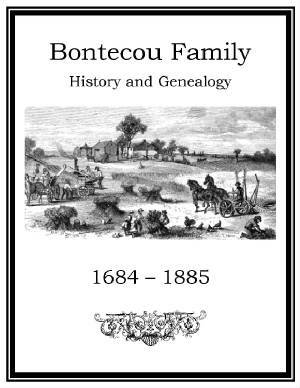 Bontecou Family History and Genealogy PDF eBook English 12.6 MB 1885. This record of the descendants of Pierre Bontecou took 2 years to complete with over 1,200 letters being composed and mailed. A 27 page index provides thousands of descendants and in-laws. Vital names and dates span time from 1684 up to 1885 with 9 generations being documented. Family lore of the Dutch or Flemish origins indicate that they were refuges from the Isle of Re in Europe to La Caroline in Colonial America. An excellent genealogical resource for the Bontecou family! Price $6.95 USD. 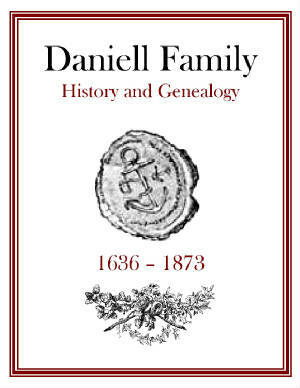 Daniell Family History and Genealogy PDF eBook English 1.37 MB 1874. The genealogy of the Daniell family includes names and dates ranging from 1636 up to 1873, with special hand written notations made by the original owner over 120 years ago. Although only 20 pages in length, this reference may feature rare genealogical information not found elsewhere! Price $6.95 USD. 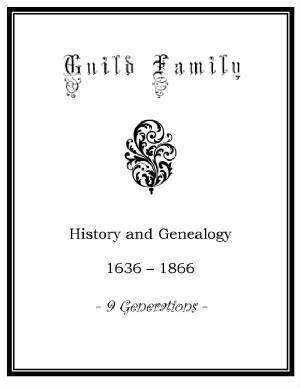 Guild Family History and Genealogy PDF eBook English 7.19 MB 1867. From Scotland the Guild family immigrated during the American Colonial period in 1636. The descendants are of John Guild with vital names and dates ranging from 1636 up to 1866 with 9 generations, and over 1,200 descendants and in-laws documented. A marvelous resource on one of Americas long standing Colonial families! Price $6.95 USD. Johnstone Family History and Genealogy PDF eBook English 23.6 MB 1909. 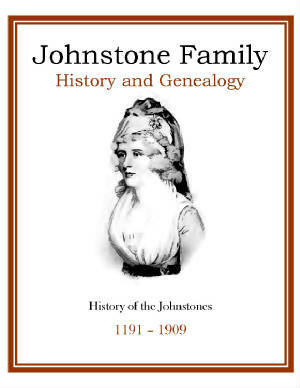 Numerous rare ancestral photographs, pedigree charts, ancient land maps, and a 40 page index with thousands of descendants and in-laws are contained in this great resource of Johnstone genealogy. It also depicts the family legends from England, Scotland, and Ireland while spanning the years from 1191 up to 1909. A wonderful resource for documentation of the Johnstone family genealogy! Price $6.95 USD. Keyes Family History and Genealogy PDF eBook English 17.6 MB 1880. On foot across the wilderness in the early 1800s to explore the Great Lakes region in search of land is one Keyes family adventure documented in this resource. Vital names and dates range from 1633 up to 1879 with a 14 page index listing over a 1000 ancestors and in-laws. You will get a real frontier feel as you read through the genealogy! 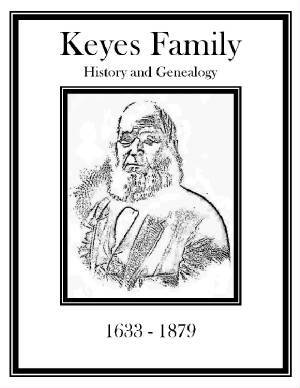 A must have resource for the Keyes family genealogist! Price $6.95 USD. 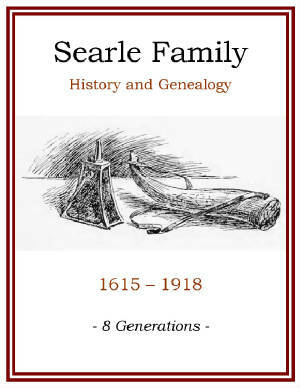 Searle Family History and Genealogy PDF eBook English 9.07 MB 1918. This 8 generation resource, covering the years from 1615 up to 1918, was compiled over many long nights on a manual typewriter just before, and then after the end of the first World War. There are letters and short biographies with many details on family ancestors. Perhaps, this great reference may feature rare genealogical information not found elsewhere, since few were produced by way of a turn of the century manual typewriter! A great link to the past! Price $6.95 USD. 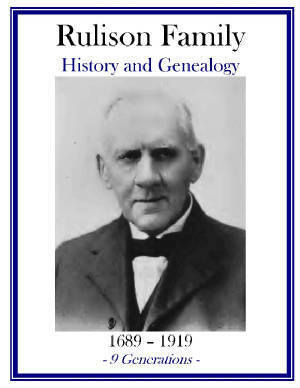 Talbot Family History and Genealogy PDF eBook English 2.09 MB 1895. Peter Talbot was seized by a press-gang into the Royal Navy in his youth, and he jumped ship to return home not long after. That was about 1677. Many more family adventures are contained in this great resource including family lore dating back to 1331. Vital names and dates range from 1677 up to 1893. 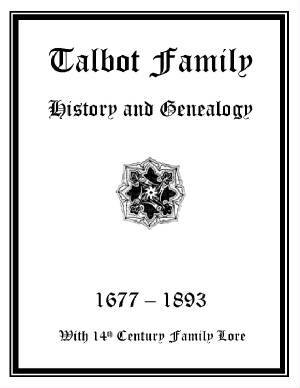 A treasure of genealogy for any Talbot family member! Price $6.95 USD. 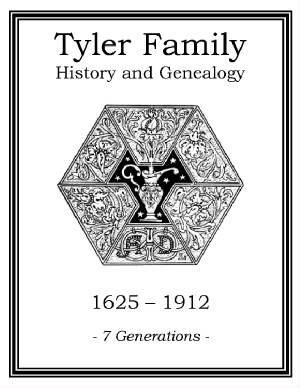 Tyler Family History and Genealogy PDF eBook English 2.49 MB 1912. The Plymouth Colony was just being settled when the Tyler family put their roots in what became Salem, New Jersey. There are 7 generations listed with names and dates, which span the years from 1625 up to 1912. This heritage begins with the colonial pioneer William Tyler. An excellent family resource! Price $6.95 USD. 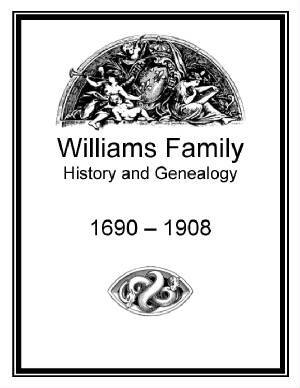 Williams Family History and Genealogy PDF eBook English 3.28 MB 1908. The Williams family history has very ancient roots in the country of Wales. It was George Williams, a member of the Society of Friends, who immigrated to the American Colonies, and his descendants branched out extending to the Panama Canal over the centuries. The pages are faded with time, but readable. Vital dates range from 1690 up to 1908, and there is a 7 page index listing over 500 names of descendants and in-laws! A great reference saved from the ravages of time! Price $6.95 USD. 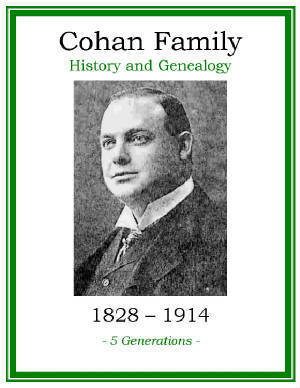 Cohan Family History and Genealogy PDF eBook English 1.70 MB 1914. From the Irish emigration of William Cohan to America about 1847 this resource provides 5 generations with short biographies on some family members. Vital names and dates range from 1828 up to 1914 with a few faded photographs. The contents include a directory of family members living as of 1914. Although only 20 pages in length with some pages faded with time, the information is still readable; and, is a testimony to this courageous family finding new roots after the great Irish famine! Price $6.95 USD. 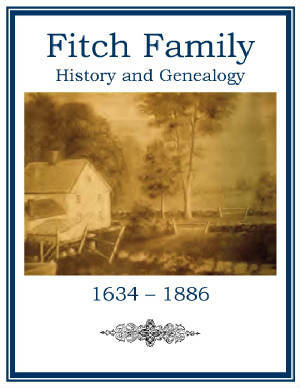 Fitch Family History and Genealogy PDF eBook English 6.02 MB 1886. In this great resource the legend of the family name begins at the end of the High Middle Ages in 1294. The family Coat of Arms accompanies more recent names and dates through the American Colonial period, which stretches from 1634 up to 1886. A source of important documentation which may extend the Fitch family genealogy! Price $6.95 USD. 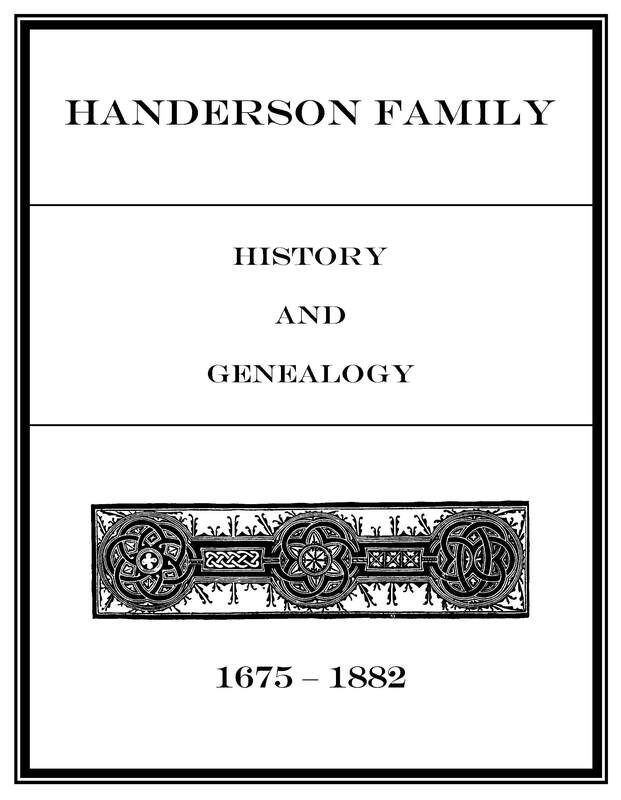 Handerson Family History and Genealogy PDF eBook English 4.62 MB 1885. This is a great source of Handerson, or Hanison, kindred with names and dates stretching from 1675 up to 1882. There are 8 generations listed with brief remarks accompanied by a 5 page index, which lists hundreds of names over this 200 year period. An essential resource for the Handerson family genealogist! Price $6.95 USD. Rulison Family History and Genealogy PDF eBook English 12.2 MB 1919. Rulison, Rulifson, Ruliffson, and allied families in America from the year 1689 up to 1918 are documented in this wonderful resource! There are 9 generations compiled with a 23 page index listing over 1,500 descendants and in-laws! A great resource for one of Americas Colonial Era families! Price $6.95 USD. Steiner Family History and Genealogy PDF eBook English 4.44 MB 1896. 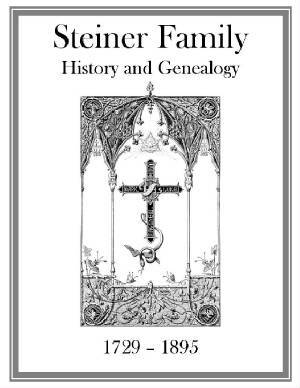 In this great resource the Steiner family name is traced back into German history to around the year 1340, and those with likely kinship ties of that period have short biographies provided. Immigrating to the American Colonies Jacob Steiner began the family roots in North America. Names and vital dates range from 1729* up to 1895. There is a 14 page index with over 1,000 descendants and in-laws! You may discover another century of Steiner genealogy! Price $6.95 USD. Tyson Family History and Genealogy PDF eBook English 4.06 1912. After 49 days aboard the wooden ship Concord, which brought numerous Dutchmen to the New World in 1683, was the progenitor of the Tyson family that first reached the American shore. 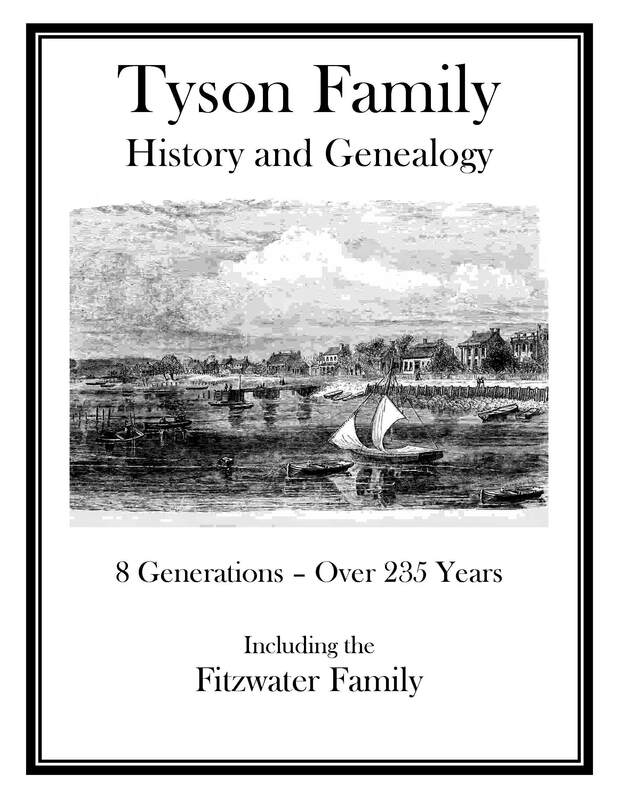 This is an excellent source of Tyson and Fitzwater family history that covers 238 years, and 8 generations! Great information on one of Americas long standing Colonial families! Price $6.95 USD. 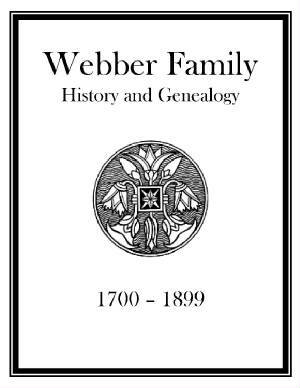 Webber Family History and Genealogy PDF eBook English 1.00 MB 1900. The Webber family came from England to the American Colonies in 1722. Although only 10 pages in length, this publication provides 6 generations that span yesteryear from 1700 up to 1899. Perhaps a source of essential Webber genealogy unique to this publication! Price $6.95 USD. 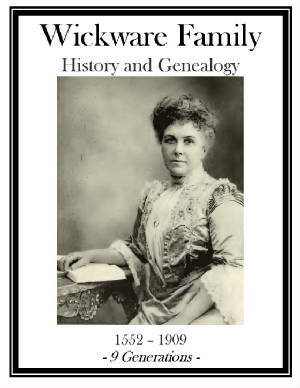 Wickware Family History and Genealogy PDF eBook English 12.6 MB 1909. An account of the origin and early history of the name in England back to 1086, and the record of John Wickware, who emigrated to the American Colonies in 1675. There are numerous rare ancestral photographs, Deeds and Land Grants, Coat of Arms and Crest, Facsimile from the Domesday Book, and 9 generations spanning the years 1552 up to 1909. A list of family soldiers on both sides from King Philips War of 1675 up to the Spanish American War. A 31 page index lists over 2000 names of ancestors and in-laws! A treasure of Wickware, Wickwire, or Wyckwarre genealogy! Price $6.95 USD. 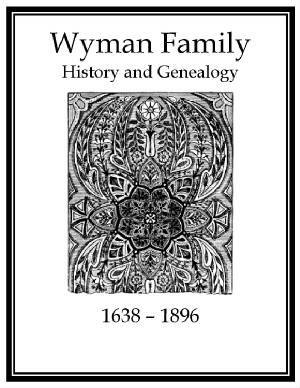 Wyman Family History and Genealogy PDF eBook English 1.80 MB 1897. The Wyman family came from Herts County, England, to the American Colonies in the early 1600s, and survived the attacks of Native Americans while living near Woburn, Massachusetts. This reference has extraordinary information on the family in England, although the pages are faded with time. Vital dates range from 1638 up to 1896. Although only 31 pages in length, this reference provides a rare glimpse of the family during colonial times. Price $6.95 USD.